GHAC is calling application from all outdoor enthusiasts who would like to learn outdoor leadership skills required to conduct and lead outdoor activities with GHAC. Planning, leading, surviving and making decisions in wilderness conditions prepares one for day to day challenges of life. Learning's in the outdoors helps one internalize and personalize the experience and take the them back to their personal and professional fronts. This is the most effective way to develop leaders. The program focuses on skills that build confidence and competence in leaders conducting outdoor camping and trekking experiences in the wilderness. This Outdoor Leadership Workshop is a highly selective process to spot and train outdoor enthusiasts to become exceptional Outdoor Leaders. • Define the basics of Outdoor Leadership. • Recognize the Safety requirements for conduct of Outdoor Events. • Relate to the Group Behavior and Interpersonal skills required to conduct outdoor events. • Relate to the Judgement and Decision Making Skills in the Outdoors. • Demonstrate the Outdoor Safety skills required to organize and lead teams with all safety. • Practice Wilderness Survival Skills, Map Reading and Navigation, Camping Skills, Basic First Aid, Knots and Lashings. For Whom: Open to individuals aged 18 years and above with a passion for adventure and who want to learn Leadership, Decision Making, Teamwork, Outdoor Skills required to lead adventure and outbound expeditions. 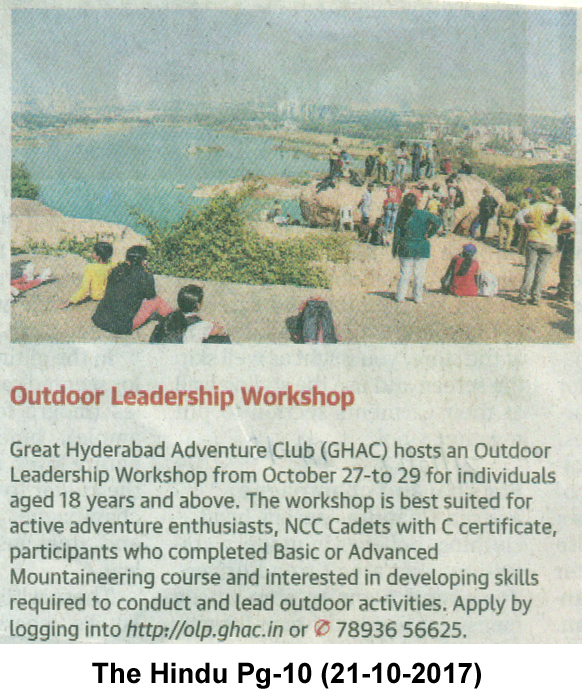 Prerequisites: Active Adventurers who have done 5 Local and 5 Outstation events with GHAC or other Adventure Clubs. The Rule is relaxed for NCC Cadets with B or C certificate, members with Basic or Advanced Mountaineering, ex-servicemen and experienced active adventure enthusiasts. Adventure clubs and organisations working in field of outdoor education may also send their nominations if the participants qualify the prerequisites.